Comic book readers around the world are shocked and deeply saddened at the news that the legendary Marvel Comics co-founder Stan Lee had passed away earlier today. The industry icon was 95 years old and at the time of our memorial composition the COD is not clear. Stan had been in questionable health over the last few months and while 95 is clearly a fantastic bit of time to have spent here on Earth, we are still sad since he is the reason that so many of our childhood imaginations were so vivid and inspiring. Speaking personally I was a big fan for many, many years and have been reading Marvel Comics stories since the early 70’s. I guess its safe to consider me one of the diehards and it was all thanks to Stan Lee who brought these characters to my regular reading times. Before I continue along, these images were all snapped by me at the NY Comic Con with some of them being from back in 2011 and the more recent ones from 2016. There is so much to say about the late great Stan Lee but I will leave you to read all of that in his Official Wikipedia entry which is linked at the close of this toast. You all should know how he co-founded Marvel Comics and was the creator of such characters like Fantastic Four, Amazing Spider-Man, The X-Men, Incredible Hulk, Mighty Thor, The Avengers, Ant-Man and The Wasp, Black Panther, The Inhumans and so very many more. Most of my childhood allowance went to the purchase of these monthly issues and while I don’t have the super duper rare ones I do have a lot of the rest. Most of you are probably in the same boat if you were longtime collectors. 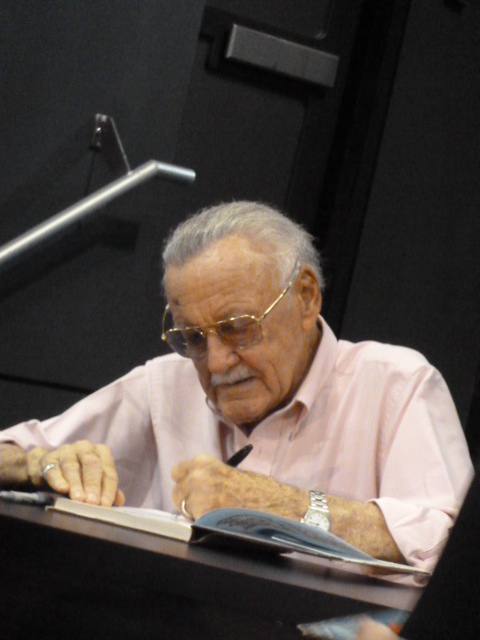 Thanks to Stan Lee my creative worlds were expanded and presented right before my eyes. It was amazing, fantastic and incredible and by the way, that’s the title of an illustrated memoir to Stan’s life which I highly recommend. I’ll link to it down below so you can look into a copy. One of the creative business highlights that Stan spearheaded was known as “The Marvel Method” and this was when a brief script would be handed to artists who would then fill the pages with illustrations that completed the store. Stan would then return to these pages and add the proper word ballroom and dialogue to the issue. It was a process that was clearly ahead of its time for the industry. Lee was not officially involved in the comic book company for a while at the time of his passing but was beloved by the fans of the films where he had a cameo is so many of them. One has to hope that both the upcoming “Captain Marvel” and untitled “Avengers” film have one last bit featuring The Man. This small group of photos were from 2016 which I believe was the very last time that he had paid a visit to the NY Comic Con. He was 93 at the time and how much should we be expecting him to run around at that point. Still, I had to say that he seemed charged up by the crowd who rallied around him like the president himself was in attendance (well, one that people like I should stress). They didn’t call him “Stan The Man” for nothing after all. Though I am saddened by the loss I am also smiling at the fact that he brought my friends and I so much joy for so many years of our lives. Let’s face it, 95 years of age is awesome to have reached after so many accomplishments. I was fortunate enough to have met him on a few occasions many years ago when I attended parties hosted by Marvel Comics since so many friends worked there. I dug up this bit of ancient history from 1995 (I think) and it made me smile on its discovery and I am glad to be able to add it to my toast. It was awesome to have met him back then and he was so friendly and positive to my younger self and its been a memory that I never forgot. 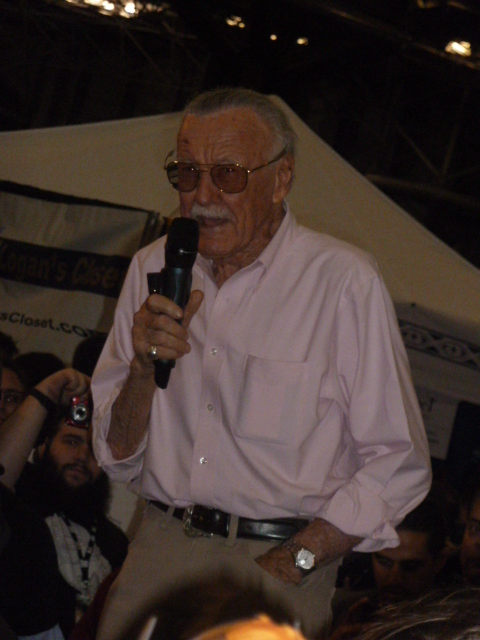 Thank you Stan “The Man” Lee for everything you did for Pop Culture. Your numerous creations will live on for far longer than most of us will and that is fantastic. May you Rest In Peace and keep inspiring the creative minds from the great beyond. Goodnight, and “Excelsior” Good Sir. We wish his family, friends, business associates and the millions of fans of his work the most heartfelt of condolences during this time. Let’s remember the joy he brought forth even more today. Fans of the mans work should chime in with their favorite Stan Lee story or memory. I’d love to hear them. I am deeply saddened bu the news of Stan Lee’s passing along with so many others. He is a hero to my, he really made my childhood exciting and filled with joy from comic to cartoons and look forward to getting action figures of my favorite heros like wolverine who I felt like I could relate to. Growing up I looked foward to conventions like comic con and the marvel netflix series. I have so much to be happy about because Stan Lee has left us with a gift, Marvel.